I am frequently asked,” How Often and How Hard” to work out for weight loss. Having lost substantial amount of weight myself and as a Fitness Instructor & Transformation Coach, I have learned a thing or two about what will give you the best results for the effort you put in. I can’t stress enough the importance of weight training. When the end goal is weight loss (or pretty much any end goal), a weight-training program is a must. Let’s get real. Sure, you can cut your calories in half, or spend your morning or evenings doing cardio to lose some pounds, but I can promise you will not last nor will they give you a healthy looking and functioning body. When it comes to weight training for weight loss, it is important to put a few key points out there. First, you will not get BIG from lifting weights. Just check out my post on Skinny fat to fit and firm. You get “big” from overconsumption of energy (calories), which can be converted into fat or muscle based on the types of foods you eat and the exercise you do. Second, you can lift more than you think—and you should (with the help of a spotter, if necessary). And finally, if weight training is done properly you will likely be sore the day or two after your workouts (especially if you are new to resistance exercise). This is called delayed onset muscle soreness, or DOMS, and it is a normal response to weight training. Be sure to stretch, drink plenty of water and incorporate sound nutrition to help your body recover quickly between workouts. Proper post work out nutrition can speed up recovery and reduce the effects of DOMs. I like to use Phormula-1 and Ignition with in 30 minutes of finishing my work out. Five Key Points for Fat Loss Success: After all, weight is just a number and doesn’t say a whole lot about your body. In the last few Months I have lost 2 pant sizes But the scale has remained the same, the difference is the amount of muscle I have. Keep that in mind as you work toward your goals. Lift heavy weights. I have worked with a lot of people over the years and I cannot tell you how many have sold themselves short. You won’t get results lifting the same weights you’ve been lifting (if you’ve been lifting). You have to go up in weight. Increase weight and you’ll increase your strength and muscle mass. Increase your muscle mass and you’ll increase your metabolic rate. Increase your metabolic rate and you will burn more calories. Burn more calories than you consume and you will lose weight. If you want to lose weight and not look soft or worry about loose skin, you need to lift HEAVY weights for fat loss. Intensity. You don’t have to spend more than 30 to 45 minutes on your weight workouts. I will do a fast and furious 10-15 min cardio first, to spike my heart rate and then keep it up by working hard through my lifting session. I love training with my powerlifting friends, but I do NOT have the focus or the time to lift weights for more than two hours. The key is to work hard throughout the entire workout, minimizing rest and keeping your heart rate elevated. I want you to fail. If you want your body to change, you have to push past your comfort zone. You can’t expect results doing the same thing you’ve always done. So when I say I want you to fail, I mean I want you to have to rest. I want you to not be able to finish that last rep or two, because you picked up the heavier weights. By pushing your body out of its comfort zone, you are forcing it to respond and to change. Your body has to use energy to repair and recover. Make your body work for you, and don’t be afraid to fail. Do superset and hybrids. A superset involves doing two or more exercises that target the same muscle group, back to back with minimal rest in between. For example, doing a set of 12 heavy squats followed by a set of 12 heavy lunges is a superset. A hybrid involves combining two or more movements into one movement. Combining a squat with a shoulder press or a lunge with a squat followed by a lunge are examples of hybrid exercises. Incorporating these into your weight-training workouts can increase the intensity of your training, which is ideal for losing weight. Circuit Training. Circuit training is a great way to get in multiple exercises. You can focus on your upper body, lower body, or total body, all while keeping the intensity up. Of course, you still want to focus on using heavy weights. 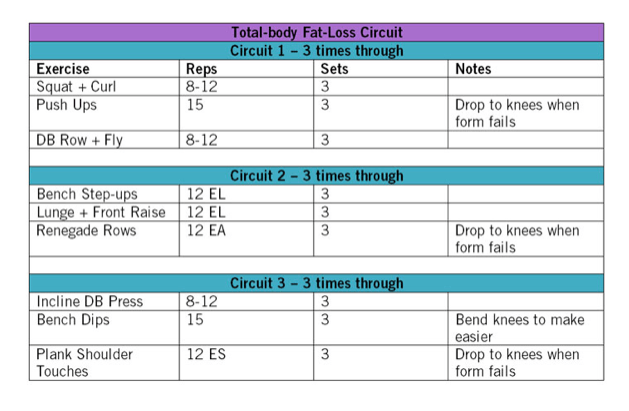 Below is a sample total-body, circuit-training workout. Move quickly from exercise to exercise and rest for a minute at the end of each round. Don’t be afraid to rest during a set, recover quickly, and then get back after it. For at home circuit ideas check out my posted work outs here. Full work out with example images Linked Here. Ultimately weight-loss occurs due to a combination of factors—sleep, nutrition, mindset and physical activity all play key roles in initiating and maintaining weight-loss. Be sure to check in with a physician before jumping into a weight-training regimen and don’t be afraid of failure. Failure is the point at which growth and change occur. Aim for three total-body, circuit-training workouts a week. If you decide to split your workouts, try to do two workouts focusing on your upper body, two workouts focusing on your lower body, and one total-body workout per week. Remember, these workouts can be as little as 30-45 minutes—the key is keeping the intensity high. Tags:#1stphorm, #fullofgrit, circuit training, Earn Better Weight Loss Results, fit mom, Five Key Points for Fat Loss Success, How Often and How Hard To Workout For Weight Loss, Ignition, Lift heavy weights for weight loss, phormula-1, Strength Training for weight loss, Weight Training for Weight Loss, weightloss, Weightloss program.